There is no better tool for discovering your innate abilities and talents than the Rockport Institute Career Aptitude Test. This innovative tool that has been around since 1981, has helped thousands of individuals worldwide arrive at an objective understanding of their natural gifts and inborn abilities, and has enabled them to align those strengths with their particular personality traits and personal preferences. 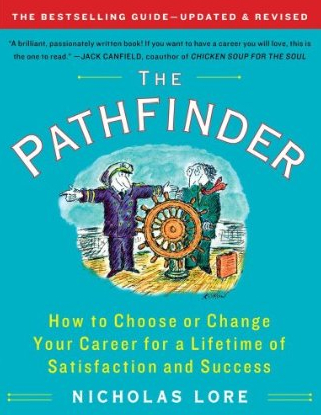 With all of an individual’s assets aligned and “pulling in the same direction,” the path to the ideal career becomes clearer and easier to navigate. This test will help you see what makes you unique and how you can use that to contribute to the world. If you recognize and appreciate the value of understanding yourself more fully, of gaining in self-confidence and clarifying your career options, then you are poised to benefit greatly from this powerful program. The findings of this test will show your innate abilities, what you do best naturally, what comes easiest to you, and what you enjoy doing. You need to know what these are in order to identify where you can best use these traits in your ideal career. Whether you’re a young person interested in knowing your inborn strengths and abilities, a first-year college student selecting a major, a recent graduate just heading into the workforce, a man or woman anxious to re-enter the job market, or a midlife professional interested in upgrading to a more suitable and satisfying career, it’s critical to be pointed in the right direction. This is an insightful test administered by an outstanding affiliate of the Rockport Institute, Rick Duff. People who are highly successful and love their work year after year spend most of their time in activities that make use of their strongest aptitudes. The Rockport Institute Career Aptitude Test is mailed to your home (along with instruction CD), where it can easily be completed in approximately three hours. Within a week of Rockport receiving your completed test, you will receive your result. You will contact Rick to set an appointment for the test review once you have also complete the Client Information form, and Rick will spend an hour and a half on the phone helping you interpret the results and answer any career questions you may have. 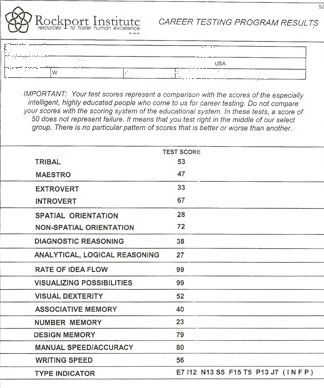 Here is an example of how the test is scored. Once you understand your core profile, the 13 strengths, the innate talents, and your personality type, this session ignites a true awareness of who you really are. With this knowledge you will gain self confidence, direction, and clarity about how to successfully move toward and find your dream career. Having an awareness of who you are, is a gift in knowing how to successful navigate through life.